Why Choose UShake Running Belt? Here are the Reasons: The pouch is very comfortable to wear. It's made of high elastic straps that can be adjusted from 27.5 " to 43.3" which gives it an amazing fit so that it is suitable for most men and women. 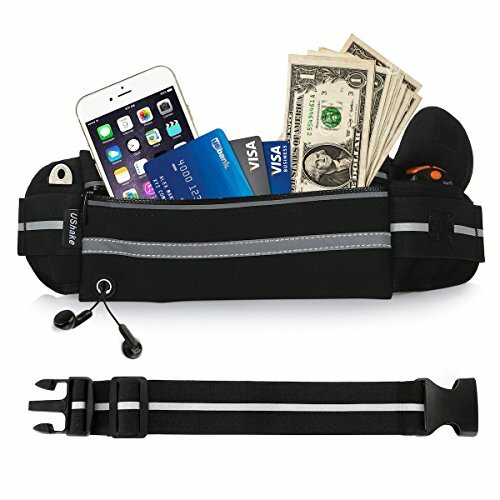 This lightweight, durable running belt is perfectly designed for your phone, key and cash. The Breathable material will keep your body cool, ensuring better exercise experience for you. It will not bounce or chafe during long run or intense workout. Plastic zipper design allows you to enjoy a run without the sound of metal zipper. Ideal for Smartphones: The pouch is compatible with: iPhone 6 / 6 Plus / 6s / 6s Plus iPhone 5 / 5s / 5c iPhone 4 / 4s Samsung Galaxy S6 / S5 / S4 And more smartphones Package Includes: 1 * USHAKE Running Belt, Black Lifetime Warranty At USHAKE DIRECT, our first priority is customer satisfaction. We provide 100% Satisfaction Guaranteed and backed by our LIFETIME WARRANTY. Contact us immediately if anything comes up! Superior Quality & Comfortable Wear - Not only durable, but also light and compact for your comfortable wear. With adjustable stretchy straps, Nylon Lycra fabrics for breathable material can keep your body cool. No bouncing, no chafing and no clutter. NOT FOR WALLET! Weather Resistant - Water resistant material and zipper keeps your valuables safety, protecting them from sweat, rain, and dirt. Stay dry and safe. This is a great product used for a hiking trip because most of backpacks do not have a zipper compartment close by. Fashionable & Jog safely - Reflective material will form a visible strip on the front pocket for better activity at day or night; zipper in the front design to enable easy reach to the phone during running. Ample Storage Space - Main pouch size: 3.74" x 7.68" (HxW). Provides independent protection for your phones from screen scratches, cash, key and watch from Water, Sand, Dust and Dirt. It is easily for running, hiking, cycling, and other outdoor sports with no worries. EXTENDER BAND: It fits the 27"-45" waists and increase length by a 11.8" extender for plus size people! 100% Satisfaction Guaranteed - UShake Running Belt is backed by our 1 year warranty.